The Seattle Seahawks were struggling at 2-6 and coming off a heartbreaking overtime loss to the Cardinals the previous week as they hosted the New York Giants on November 5, 1995. First-year Head Coach Dennis Erickson’s team had talent, with RB Chris Warren and exciting rookie WR Joey Galloway noteworthy on offense and DT Cortez Kennedy anchoring the defense. However, QB Rick Mirer (pictured at right) was on shaky ground, having been benched in favor of John Friesz, who suffered a shoulder separation against the Cards, and problems with pass protection made it all the more problematic. The Giants were also experiencing difficulties in their third season under Head Coach Dan Reeves. 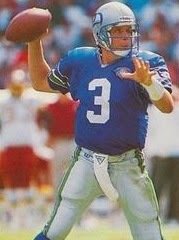 QB Dave Brown had yet to produce the results anticipated when he was handed the starting job the previous year. RB Rodney Hampton was the key to the run-oriented offense and rookie Tyrone Wheatley, drafted in the first round, had been added to the mix. There were 42,100 fans in attendance at the Kingdome. The first series of the game ended in a punt by the Giants, and the Seahawks drove 62 yards in five plays. Rick Mirer finished it off with a pass to WR Brian Blades for a 33-yard touchdown and Todd Peterson added the extra point. New York responded with a 10-play, 61-yard possession. Dave Brown completed three passes, the biggest to WR Mike Sherrard for 25 yards in a third-and-10 situation. That gave the Giants a first down at the Seattle nine, but they were unable to reach the end zone and Brad Daluiso kicked a 23-yard field goal that made the score 7-3. The Seahawks responded with a 59-yard drive that took five plays. Mirer again connected with Blades, this time for a 44-yard TD, and with Peterson’s kick, Seattle’s lead was enlarged to 14-3. It got larger when the Giants punted following their next possession and Joey Galloway (pictured below) returned it 89 yards for another touchdown. Peterson again successfully converted. Down by 21-3, the Giants were moving as the first quarter ended and advanced 62 yards in nine plays. Brown completed another four passes, the last to RB Herschel Walker for an eight-yard TD. The Seahawks went three-and-out on their next series, punted, and New York drove from its 20 to the Seattle 35. Facing fourth-and-four, the Giants lined up in shotgun formation but Brown punted instead. The Seahawks had another short series ending with a punt, and taking possession with 3:21 remaining in the first half, New York advanced 48 yards in four plays to score again. Brown had two short completions and finished the series off with a pass to Sherrard for a 28-yard touchdown. The try for a two-point conversion failed, but the visitors were now behind by only five points at 21-16. Mirer attempted to pass the Seahawks down the field in response, but CB Philippi Sparks came up with an interception that gave the Giants the ball at the Seattle 46 with 53 seconds still on the clock. Brown threw to WR Chris Calloway for 15 yards and Sherrard for 30 to the Seattle one. From there, Rodney Hampton went up the middle for a TD. New York again went for two points and failed, but the second quarter comeback had put the Giants in front by 22-21 at halftime. Seattle started off the third quarter with a 10-play, 70-yard series. RB Lamar Smith, replacing the injured Chris Warren, carried most of the load, gaining 35 yards on six carries and Mirer threw a pass to Blades that picked up 28 yards. The drive stalled at the New York five, but Peterson kicked a 23-yard field goal to put the Seahawks back in front by 24-22. The Giants punted following their next possession and Seattle again put together a long series. Again the Seahawks primarily kept the ball on the ground and were helped along by two defensive penalties. Mirer completed a pass to Galloway for 10 yards in a third-and-nine situation and FB Steve Smith gained four yards up the middle to convert a fourth down, but Lamar Smith fumbled and CB Thomas Randolph recovered for the Giants at their 15 yard line. New York punted and, as the game headed into the fourth quarter, the Seahawks advanced 27 yards in seven plays. Mirer threw to TE Carlester Crumpler for 13 yards and Lamar Smith had a 16-yard carry along the way. Peterson booted a field goal from 41 yards and the Seattle lead was extended to 27-22. Walker returned the ensuing kickoff 50 yards to the Seattle 48 to give the Giants good starting field position. Tyrone Wheatley ran for 11 yards on two carries and, following two incomplete passes, Brown connected with Calloway for 21 yards to the 16. Wheatley and Hampton chipped away from there, with Hampton gaining the last yard for a touchdown. A third try for a two-point conversion failed when CB Corey Harris broke up a pass intended for WR Arthur Marshall, but the visitors were back in front by a score of 28-27. The teams exchanged punts before the Seahawks put together a long drive of 77 yards in 13 plays. Mirer completed five passes and Peterson finished the series off with a 32-yard field goal that put Seattle in front for the third time by two points. There was 1:23 remaining in the game as the Giants took possession at their 13 yard line. Brown had three pass completions, to Marshall for 14 yards, Sherrard for 16, and Marshall again for 27 yards to reach the Seattle 30. But New York could get no farther and Daluiso’s last-play field goal attempt from 48 yards was wide to the right. The Seahawks held on to win by a final score of 30-28. The Giants gained more total yards (403 to 386) and had the edge in first downs (26 to 24) and time of possession (33:14 to 26:46). Seattle suffered the only two turnovers but the Giants were penalized eight times at a cost of 81 yards, to five flags thrown on the Seahawks. Rick Mirer completed 17 of 31 passes for 253 yards and two touchdowns while giving up one interception. Brian Blades had 6 catches for 153 yards and both receiving TDs. Lamar Smith rushed for 85 yards on 19 carries. 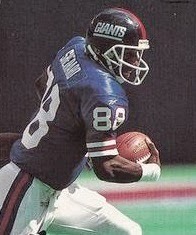 Joey Galloway contributed four pass receptions for 35 yards and, with the long punt return for a score, averaged 26.3 yards on four runbacks of punts. Todd Peterson was successful on all three of his field goal attempts, which proved to be vital. For the Giants, Dave Brown was successful on 20 of 41 throws for 299 yards and two TDs and had none intercepted. Mike Sherrard (pictured at right) caught 6 of those passes for 128 yards and a touchdown. Rodney Hampton led the rushers with 54 yards on 18 attempts that included two short TDs. The win over the Giants marked a turnaround for the Seahawks as they won five of their next six games to finish at an even 8-8, which placed third in the AFC West. New York, on the other hand, lost its next two contests on the way to a 5-11 record that meant fourth-place in the NFC East. Rick Mirer’s play remained uneven as he passed for 2564 yards and 13 touchdowns, but with 20 interceptions. Brian Blades led the team with 77 catches for 1001 yards (13.0 avg.) and four TDs and Joey Galloway finished with 67 receptions for 1039 yards (15.5 avg.) and seven touchdowns while averaging an even 10.0 yards on 36 punt returns. Lamar Smith returned to his backup role, rushing for 215 yards on 36 attempts (6.0 avg. ); the game against New York represented his most significant action of the season by far. Dave Brown threw for 2814 yards and 11 TDs and had problems with passing accuracy. Mike Sherrard caught 44 passes for 577 yards (13.1 avg.) and four touchdowns in his last of three seasons with New York.